Update: I just tested with firefox and chrome and the loose the focus in showing there as well. When using IE and selecting DropDown options with select it is not possible to focus the next element in the tabIndex since the focus got lost. 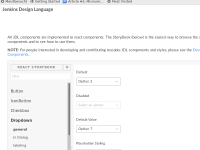 Either http://jenkinsci.github.io/jenkins-design-language/docs (someone may want to update the docs and maybe correct the url where deployed (linked to ) or in your local jdl storybook. You may need to "patch" IE and add in css height=800px to dislay div otherwise you see a too small box. When you use "document.activeElement" on the storybook page the iframe should be the result and in a jenkins instance NULL is the result. Further ESC and TAB as well are loosing focus. Because this is a really specific set of conditions (IE11 user, plus Blue Ocean, plus keyboard navigation), manual verification of this one, once fixed, seems appropriate. Karl Shultz added a comment - 2017-11-02 14:09 Testing Notes : Because this is a really specific set of conditions (IE11 user, plus Blue Ocean, plus keyboard navigation), manual verification of this one, once fixed, seems appropriate. I just tested with firefox and chrome and the loose the focus in showing there as well. Thorsten Scherler added a comment - 2018-02-09 11:06 I just tested with firefox and chrome and the loose the focus in showing there as well. Karl Shultz regarding testing notes I just found out that it applies to any browser. I further think an unit test should be covering the code change. Thorsten Scherler added a comment - 2018-02-09 11:10 Karl Shultz regarding testing notes I just found out that it applies to any browser. I further think an unit test should be covering the code change. Vivek Pandey can we backport this to 1.4.x ? Alvaro Lobato added a comment - 2018-02-09 12:04 Vivek Pandey can we backport this to 1.4.x ? Alvaro Lobato Sorry, somehow I missed it. PR is opened, https://github.com/jenkinsci/blueocean-plugin/pull/1660 for back port. I should be able to cut 1.4.2 release today after its merged. Vivek Pandey added a comment - 2018-02-16 16:57 Alvaro Lobato Sorry, somehow I missed it. PR is opened, https://github.com/jenkinsci/blueocean-plugin/pull/1660 for back port. I should be able to cut 1.4.2 release today after its merged. Alvaro Lobato Ported and 1.4.2 released. Vivek Pandey added a comment - 2018-02-16 22:14 Alvaro Lobato Ported and 1.4.2 released.